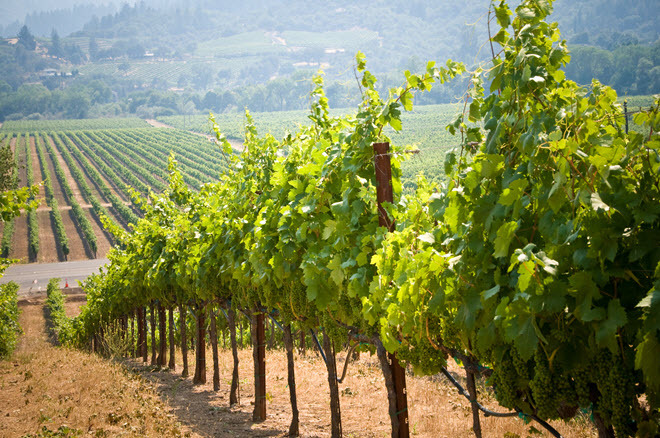 An hour north of the San Francisco Bay area in California is one of the premier wine producing areas of the world – Napa Valley. Although some wineries here date from the 1800s, it wasn’t until the 1960’s that Napa Valley wines became true players on the world stage. Hand-in-hand with world class wine comes world class food, and the Napa Valley has its share of both gourmet boutique restaurants and 5-star establishments. In such a wine and food rich area, it’s no wonder there are numerous places where both the weekend gourmand and the next international chef can learn how to improve their culinary skills. Billing itself as “The World’s Premier Culinary College,” the CIA’s campus in Napa Valley is a picturesque one if nothing else. Established in 1995 and located in St. Helena, CA, about 30 minutes from downtown Napa, CA, the CIA’s Napa Valley headquarters is located in an enormous castle-like campus called Greystone that was built in 1888. Boasting 15,000 square foot teaching area, a demonstration theater, 15 acres of vineyards, an herb garden, and numerous other amenities, the CIA at Greystone is a sight to behold. The campus offers Associate degrees in both Culinary Arts and Baking and Pastry Arts for the culinary professional and CIA Wine Certification, both Foundation and Advanced Levels, as well as a 30-week Accelerated Wine and Beverage Certificate program. They also offer a comparable 30 week Accelerated Culinary Arts Certificate program. For the food enthusiast, the CIA Greystone offers 4 day and 5 day Boot Camps in addition to multi-day Career Discovery courses to expose the students to careers in culinary arts, baking and pastry arts, and the world of wine. They also offer 1 and 2 day Sophisticated Palate course, designed to both teach students to not only cook but also expand and upgrade their own palates. Finally, they offer cooking demonstrations and campus tours on the weekends. And for the stay-at-home enthusiast, or one who does not wish to travel to the Napa Valley, the CIA offers a number of online courses through their website. Located in Napa, CA with a satellite campus in St. Helena, CA, the Napa Valley Cooking School in the Napa Valley College offers both a one year course for the aspiring cooking professional and evening and weekend classes for the food enthusiast. The first semester of the one year course focuses on basics, while the second semester goes into more detailed aspects of the culinary professional’s career, both in terms of food and running a restaurant. At the end of the on-campus instruction, students with a C or better will take part in the “Externship” program by finding a position at a fine dining establishment in order to further hone and develop their skills and abilities. With an 80% completion rate and a 1:10 teacher to student ratio, the Napa Valley Cooking School is an enticing option, however one needs to be aware that the 1-year course results in a certificate of completion only and no degree. No academic credit is earned and the classes are not transferable to another learning institute. The focus is on real world skill building as opposed to academics. Offered several times throughout the year, Hugh Carpenter’s Camp Napa Culinary school is a weeklong cooking and winery experience in the heart of the Napa Valley. In operation since 1991, Camp Napa Culinary’s program is designed for food enthusiasts and travelers who are looking for a kind of learning vacation, combining their love of food, travel, and good wine. The cooking instruction is all based on the recipes from Hugh’s numerous cookbooks, 15 at last count, and is geared more for someone who is new to cooking or is somewhat familiar to the kitchen. Professionals may feel a little out of place, or at least not greatly challenged. Offering “Gourmet Retreats,” Casa Lana’s cooking courses vary from 5 hours to 5 days in length. Set in a handsome and stylish bed and breakfast in Calistoga, CA, about 40 minutes north of Napa and in the northern end of the Napa Valley, Casa Lana provides all the equipment you need to turn your cooking interest into a passion. 5 day Boot Camps for advanced cooks, 5 hour and 1 day Wine Country classes for the enthusiast, 3 and 5 day Culinary Learning vacations and 2 day Gourmet Weekend Retreats, Casa Lana has something to offer almost anybody interested in preparing and eating fine food. In operation since 1999 and backed by owner Lana Richardson’s 20 plus years in the food industry, this would be a good choice for anyone of any level. Backed up by owner Julie Logue-Riordan’s 20 years of culinary teaching experience, Cooking with Julie offers a dizzying array of culinary classes. Mostly short term classes that last the better part of a day, Logue-Riordan tries to focus on natural and local cooking, offering a number of Farmers’ Market tours, where the class goes to one of several local Farmer’s Markets then returns to cook up the day’s purchases. Also offering an Apprentice Program, where the apprentice goes through two classes worth of training before qualifying as an apprentice or assistant, the classes offered at Cooking with Julie are tuned more for the local food enthusiast or the visiting traveler who wants to experience a gourmet cooking class. Whether you are an established professional looking to hone up on your skills or someone who loves cooking and is looking for a little bit of hands-on experience in a food and wine lover’s hotspot, Napa Valley has what you are looking for in culinary instruction.